Do you need to buy new summer clothes for your kids? Or maybe it’s time to update your own wardrobe. 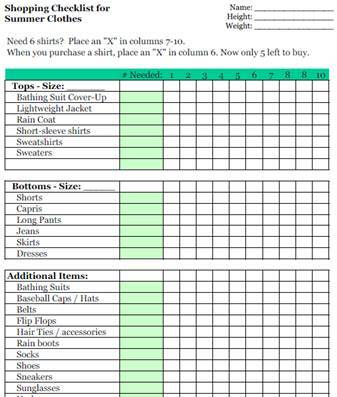 Use our handy Shopping Checklist for Summer Clothes to keep track of the items you need to purchase. If you’re shopping for children, it’s important to know your child’s height and weight before your start shopping. This will help you determine the size of clothing to purchase. This entry was posted in Organization and tagged checklist, printable, summer on February 26, 2014 by Running A Household.